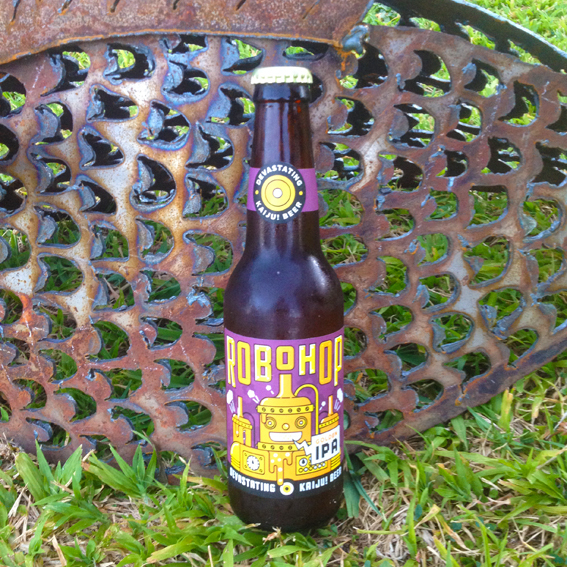 Kaiju!’s Robohop – Serve the public beer! This my first venture into Kaiju! territory and possibly my first ‘golden IPA’. I’ll have to take their word for the colour as I drank it straight from the bottle, next time I’ll pour it into a glass as I think this beer needs to breath to bring out the best in it. I detected stone fruit and tobacco as I sniffed the bottle’s mouth (that sounds a bit wrong doesn’t it?) and I was expecting fruit when I took the first swig. Unfortunately, it was the tobacco flavours that shone through immediately, not something you’d associate with an IPA. A JPS, yes, but not an IPA. This is where the breathing comes in, once the air has got to the ale, it’s more subtle flavours come through, lychee and rockmelon balanced with a grassy bitterness. This all adds up to a very different but satisfying brew and before you know it, the bottle’s empty. Would I recommend Robohop to other carbon-based organisms? Affirmative. Should Kaiju! develop a merch shop with their label designs on t-shirts? Hell yeah! Robohop – Serve the public.